I am coming to the end of my stay in the Bay Area which has been quite wonderful. Lots of marvellous friends to see, delicious meals, fabulous scenery and the opportunity to give a talk at Omnivore Books about the new edition of Offal, the Fifth Quarter which I really enjoyed. Great shop, great owners and great audience! 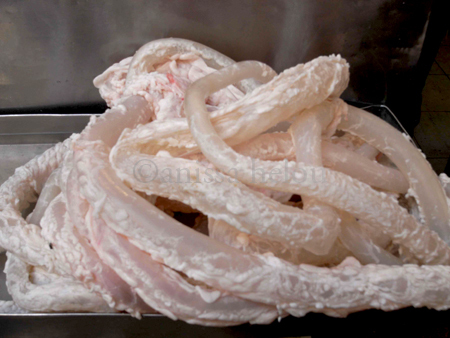 I am often asked why offal and I always have two replies. The first is that I come from a culture where no food is wasted. 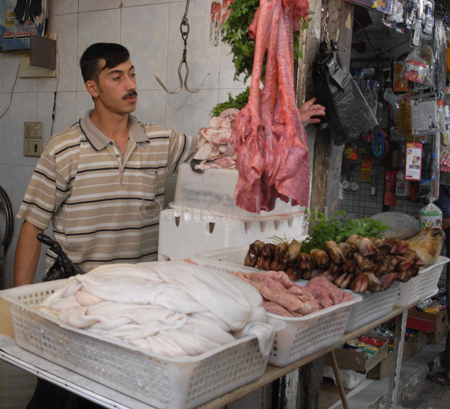 Whether it’s the entrails of meat or those of vegetables, the Lebanese (and Syrians) use everything that is edible. When we stuff vegetables, we use the core to line the pan in which we cook the stuffed vegetables or we use the core to make omelettes. 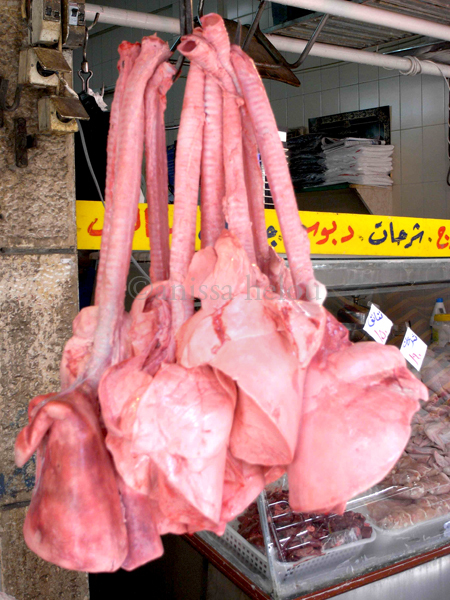 And when mountain people butcher a whole lamb to make qawarma, they serve the raw liver still warm for breakfast before the women set about cleaning and stuffing the tripe and intestines to cook with the trotters. They also stuff the spleen with a pungent cilantro and garlic ‘pesto’ and stew it in vinegar. And they stew the lungs and heart in a tomato sauce and sauté or grill the testicles and kidneys. As for the head, it is either baked or boiled. The day is a kind of lamb ‘matanza’ and the occasion for much feasting. I should have had all these recipes in my first cookbook, Lebanese Cuisine, but my then agent, Caroline Davidson who was Alan’s daughter discouraged me from doing it because people were disgusted by offal! I stupidly listened to her and it always rankled with me that I hadn’t included an offal chapter in my book. Then a year or so after my book came out, I was at the Oxford symposium talking to Tom Jaine about a tripiere he had beaten me to buying at the bring-and-buy and I told him that I wanted to write a book about offal. He thought it was a good idea but I didn’t pursue it until, that is, Caroline called to say Jon Croft at Absolute was looking for an author to write a book on offal. She had initially thought of Tom who said she should talk to me. Fortuitous! There are two main reasons to appreciate offal. The first is the fact that none of the animal is wasted and the other is because they are the rarest and in some cases, the most delicate cuts with very interesting textures. My favourite are testicles, brains and sweetbreads and when my lovely friend Margo asked at the talk which was the best offal to start with if you are an offal virgin (my words, not hers! ), I suggested the latter. So, here is a recipe for sweetbread boreks which should convert the most die-hard anti offal eater! Soak the sweetbreads in cold water for a few hours, changing the water regularly. Drain and rinse until the water runs clear. Remove as much skin as you can without damaging the sweetbreads. Put the sweetbreads in a pan and cover with cold water. Add the lemon juice and a little salt and bring to boil over a medium-high heat. As soon as the water comes to the boil, drain the sweetbreads and dry with kitchen paper. Chop up the meat very small and transfer to a mixing bowl. Add the rest of the ingredients and mix well. Taste and adjust the seasoning if necessary. Place a sheet of filo pastry on your work surface. Brush with melted butter and fold in half lengthways. Brush again with melted butter. Place 1 1/2 tablespoons filling about 2 cm away from the edge of the pastry. 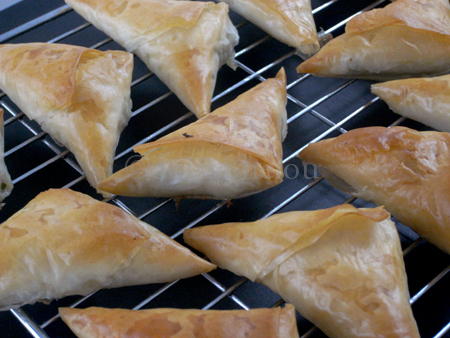 Taking a corner of the pastry, fold the filo over the filling to form a triangle. Fold again, continuing with the triangle shape until you reach the other end, brushing with butter every two or three folds. Once you have finished making the boreks, you can either deep-fry them in hot vegetable oil until golden brown all oveer or bake them, as I do, in a preheated oven 180 C for 15-20 minutes or until the triangles are crisp and golden all over. Anissa you are truly an inspiration ! I like much offal but not all, it’s an issue of texture for me and it’s cartiledge and tripe I don’t like, the sweetbreads, kidneys, livers etc. of this world I love. I’m glad to met with your blog few weeks ago. We in Turkey eat offal a lot, of course you must now already. salam back. i love kokoreç and always eat it when i am in turkey. and will remember to go to sutluce area for sweetbreads in the spring 🙂 thanks for the recommendation.